MalaysiaMandau from Sarawak, Malaysia, Asia. Collector not known. Purchased by the Museum from Stevens Auction Rooms in 1925. 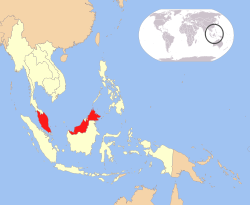 Mandau is the Kayan term for the parang ilang ('double knife'), the sword of the peoples of inland Borneo (Malaysian Sarawak and Indonesian Kalimantan). The name refers to the main sword and a smaller, secondary knife, known as a piso raout, stored on the back of the scabbard. Here, this secondary sheath is covered in red textile. The mandau is a slashing weapon, historically used for headhunting but also as an everyday machete. It is worn edge-upwards on the left hip, almost horizontally in the Japanese fashion. This example is highly decorated: the blade is inlaid with brass studs and both the carved wooden hilt and sheath are covered in tufts and fringes of hair, much as Kayan shields were. The sheath also features beadwork tassels, carved bone panels and hornbill feathers.